• Ordinary paper - Although relatively a cheap backing, ordinary paper is an adequate material for most sandpapers. The quality of paper varies depending upon the intended method of use (and price); sandpaper supplied for use with power tools generally has a tougher quality of backing paper than that sold for hand use. • Waterproof paper - Water proof paper is essential where the sandpaper is to be used with a lubricant. The back of this type of paper usually has a darker, glossier appearance. 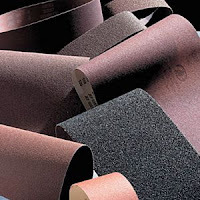 • Cloth - Generally used where a high degree of flexibility is required when using the sandpaper. • Sheets - normally (at least in the UK) about 280 x 230 mm, often sold for the DIY market in packs of 4 or more sheets, either of the same or mixed grades. Usually only suitable for hand sanding. • Rolls - available in a number of widths (e.g. 50, 115mm), each roll is of a single grade and normally is sold by linear length. Although it is produced for use with power tools (e.g. orbital sanders), it can be used for hand sanding. • Discs - for use with rotary sanders or other power tools. The discs are used with a stiff but flexible backing disc. The sanding disc is fitted to the backing disc either by a central securing screw/dished washer or by a self-adhesive backing. Various diameters of disc are available, the diameter of the sandpaper should match the diameter of the backing disc. • Belts - for use with belt sanders. Various widths and lengths are available to suit each belt sander on the market. • Specials - A number of power sanding tools are now available with non-standard 'foot prints', these require 'special' pre-cut shapes. 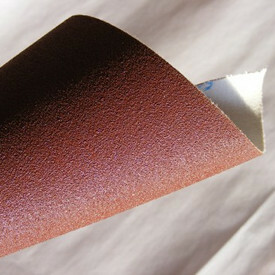 Generally, the sandpaper is attached to the tool by a self-adhesive backing. • Flexible Block - Flexible abrasive blocks are normally of rectangular cube with grit on four faces, two faces of one grade of grit and a different grade of grit on the other two faces. The block tend to be less durable, but can be useful when decorating. Blocks are available with different types of grit and different grade. • Liquid Sander - Something which is not a true sandpaper. Ideal for the 'lazy' diy'er, Liquid Sander comes in a can as a liquid. It is just brushed onto a surface, it finely abrades and cleans the surface, leaving it ready for painting. It does not really 'smooth' a surface, it just provides a key on a sound surface for a new application of paint. Generally composed of quartz granules on a paper backing, this is an inexpensive, relatively soft abrasive for sanding painted or natural timber, metal, and other materials. It wears relatively quickly and is best suited to provide a roughish finish before a really smooth surface is attempted. Normally only available with non-waterproof adhesives/backing paper. When used with water, it gives a very fine sanding of paint or varnish between coats. It can be used with mineral oil for smoothing and polishing metals. The lubricant helps to keep both the abrasive and the surface cool and floats away sanding waste; a additional advantage is that it prevents the formation of fine air-bourne dust. The wet slurry which forms will need to be wiped away during and after smoothing. 'Wet and dry' is extensively used during vehicle body painting as, with water, it can give a very smooth surface to each coat of paint - generally we expect higher quality paint finishes on Automobiles than on household fitments. Although not a sandpaper, Steel Wool is used for fine 'sanding'. It is much used by the serious cabinetmaker as it has a much finer abrasive effect than grit materials on sandpaper. The fine steel strands cuts rather than abrades the surface, producing very fine finishes; as the wool is used, small pieces of it break off and mix in with the sanding dust. Steel Wool is graded starting at a very coarse 5 through to a series of noughts - 0000 being the finest. Although excellent on timber and metal, steel wool should not be used for smoothing plasterwork or other surfaces where the fragments of steel may become embedded and could rust stains. Steel wool can be used to 'sand' complicated shapes such as metal castings or wooden mouldings. paper sold for 'hand sanding' in a power tool. • Start by using a medium or course grade paper. Change the grade of paper you are using as the job progresses. • Let the abrasive grit do the work, do not use undue pressure it will only clog the paper or cause the paper to wear out unnecessarily quickly. When power sanding, very little pressure is necessary, just guiding the tool is normally sufficient. • Use a sanding block when hand sanding. • Move sandpaper along the grain of bare timber, not across. 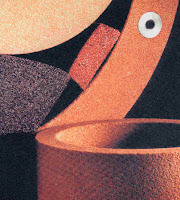 • On a smooth, non-grained surface, move the sandpaper in small circular motions. • When using a lubricant, do not let the surface dry out. If excessive wet waste material builds up, wash it away from the work area. • Take all appropriate safety precautions, especially when power sanding - refer to the instructions from the sandpapers and power tool manufacturers. Only allow competent people to use a power sander; with the abrasive surface moving it can cause injury if it comes in contact with skin or damage if brought into contact with an unintended surface. • Store sandpapers carefully in a cool dry area. Except for papers made using waterproof adhesive and backing material, any dampness may cause the adhesive or backing to fail or weaken and grains will become detached. • If the paper becomes clogged after a short time of use, look at the surface being sanded - if it is timber, the timber may be damp - allow time for it to dry out. Paint which clogs paper may either be too new to sand or old paint applied in thick coats which have not gone off. Thanks for sharing this article - it is really educational to know what are the types of papers to use for sanding. To be honest, I knew of sandpapers for too long, I wasn't even aware there were a lot of options around! I have been using sand papers all the time for the many things that I want to get turn into another shape. There are many other ways that we are able to get from the sand paper.